Yes, I know. I was supposed to post an IWSG. I had it all ready to go. So why didn't it post? Well, I got cold feet. I was feeling insecure, and then I wasn't. I wrote four different insecure writer's posts, so you'd think I would have managed to post one of them. See, I'm at DisneyWorld (no really, it's good reason not to post--also, someone else is watching the house, so it's not like people can take advantage of our not being there). I had meant to post. I really had. It was right up there with drink plenty of water and get to bed early. Those things did not happen either. I'm just worried that my Insecurities right now are just a little too unprofessional. So yeah. I'm going to keep them to myself. 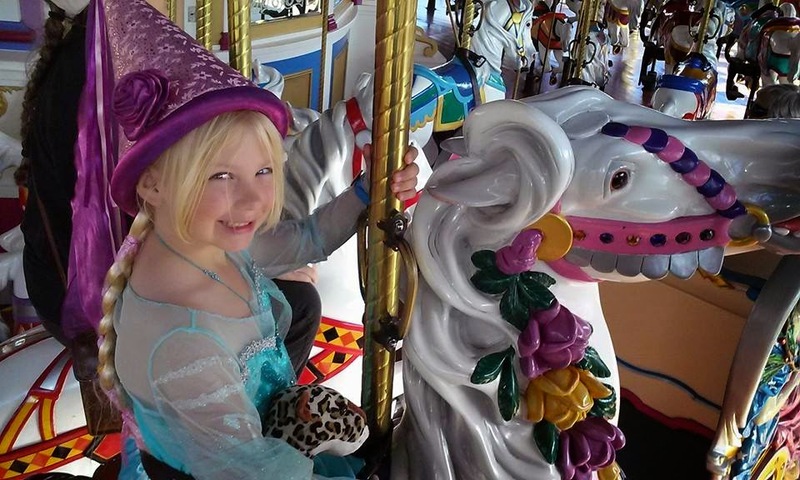 Instead, look at this great picture of my daughter riding a carousel horse. Okay, I'll sift through these posts and trickle out the parts that are fit for general consumption (well, maybe not, my thoughts have definitely been in the DON'T TALK ABOUT THAT! realm). Gotta love how we all know we've got tons of neuroses, but getting them out of our heads isn't always the easiest thing. You'd think we'd be good at the whole "make something intangible into words" thing, but noooooo.... So yeah, I hear you there. Also: totally jealous that you're at Disney World. :P Hope the trip's awesome. Have a great time at Disney World. Lol. I think I know how you feel. I've been a part of IWSG for so long I feel like I should be posting encouraging posts now, not insecure ones. . . But I'm still insecure. Well, if you're still feeling insecure and want to vent, etc, you know where to find me! I didn't post either, but due to the fact that I had zero internet for the past two weeks.